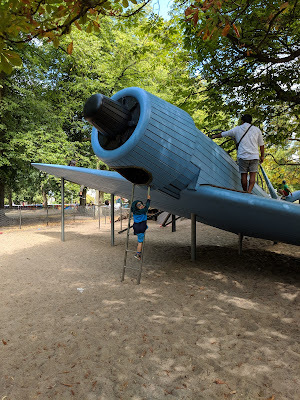 "Why travel with your kids? Traveling with kids is far different when traveling either by yourself or just you and your significant other. It requires a whole set of other criteria and agendas. You can plan for certain things and must be flexible enough to just go with the flow. My husband and I enjoyed traveling, even before our children came into the picture. Those days of travel are so different to our days of travel now. We were always able to go, go, go - checking off everything that we wanted to see, wanted to do or eat. Now, I don't think I can imagine traveling to new places without my littles ones and being able to see it through their eyes. We've always known that having children will not hinder our plans to travel. Since then, it's been - let's see where we can go to next, with the children's input. My little tribe are five and under and they don't ask much for activities. 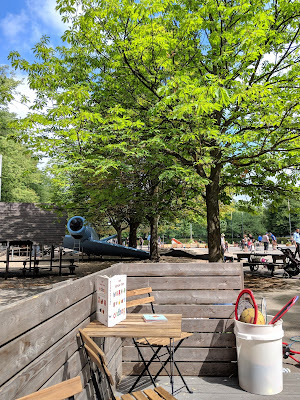 As long as there is a playground or a park to at least run around in and burn off some energy - they are happy. My view while I drink my coffee. Our first full day in Copenhagen, I wanted to take it easy for everybody, especially with us fighting and suffering from jet lag. 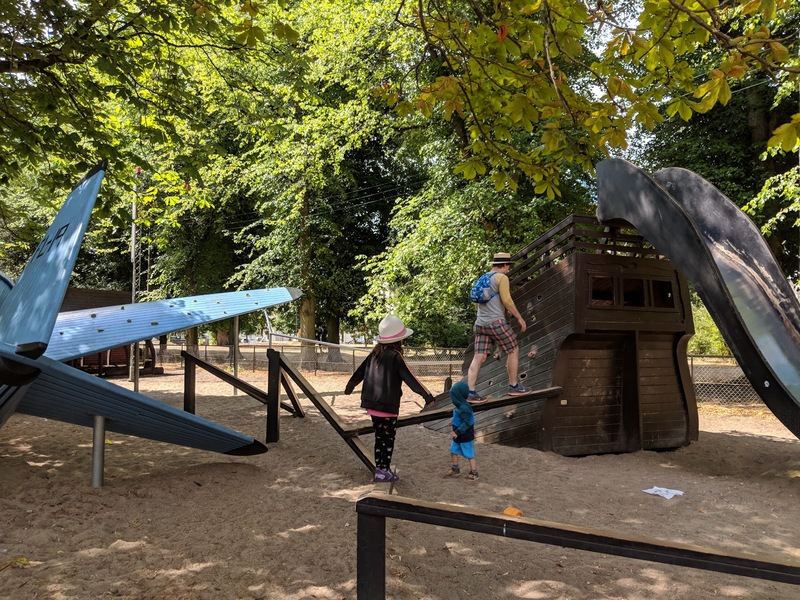 In our previous trips, I've always found that waking up early the very next day and either going for a walk or somewhere to play works wonders, especially with kids. 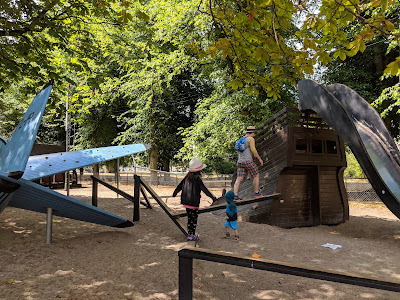 We took the kids to a playground in the Nørrebro area of Copenhagen - Nørrebropark Legeplads. The pictures that I am sharing here does not do it justice. The moment the park was within site, my little tribe took off and had a great time. Great time = three hours later, we were able to finally have lunch. 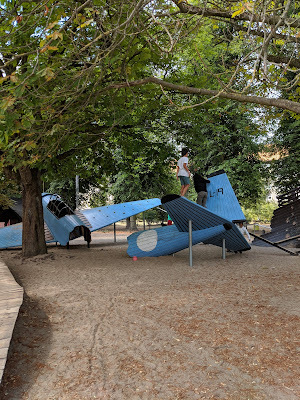 This is the first playground we visited in Copenhagen and the other ones we've been to have also amazing. The main thing = they are manned with people who work there. Kids don't have to bring their own bikes or scooters, since they are provided. By the city. Also, there is a playroom, where the kids can play with dollhouses, legos and draw art. I was given coffee. Free Coffee! What?!? Okay, it was drip coffee, but, free coffee. Where in the US can you find that? You can tell just how much the Danes value children and family. Airplane designed climbing structure next to a wooden structure that you can take a bike or scooter on. 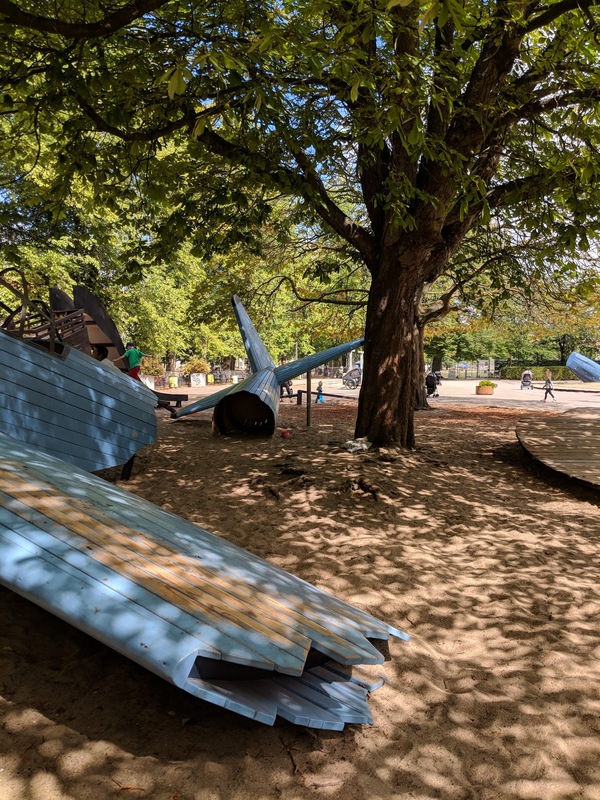 Behind the airplane, there is a pirate ship slide. This playground is also close by to many great areas to grab some coffee, food, and desserts. We ate at a local pizzeria nearby (so good!!!) and ate some artisan ice cream on the way back to the bus for our ride to the Zoological Museum. We were hoping to make be able to get some beer from Mikkeller & Friends but they were not open yet. Don't worry, we were able to find them in other places and was able to enjoy them. If you want to try them out stateside, check them out at Whole Foods. They do carry them and on a recent conversation with one of the barkeeps, they have a store in San Diego.